Dean Ambrose's SWAT team attacks Seth Rollins. Dean Ambrose's hired SWAT team provided the assist as he delivered another Monday night beatdown to Seth Rollins on Raw. Ambrose, sporting a gas mask in the style of Bane from the movie 'The Dark Knight Rises', arrived in Houston with a team of black-clad supporters, who had also taken precautions against what he called was a "dangerous slum" of a city. 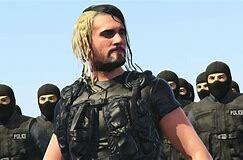 Rollins emerged from the crowd and saw off several of Ambrose's crew before getting the better of the Lunatic himself in a brawl through the fans. But the SWAT team eventually overwhelmed Rollins, setting him up for another devastating in-ring attack from Ambrose, who very much seized the momentum ahead of the Intercontinental title match between the two former Shield comrades at TLC.